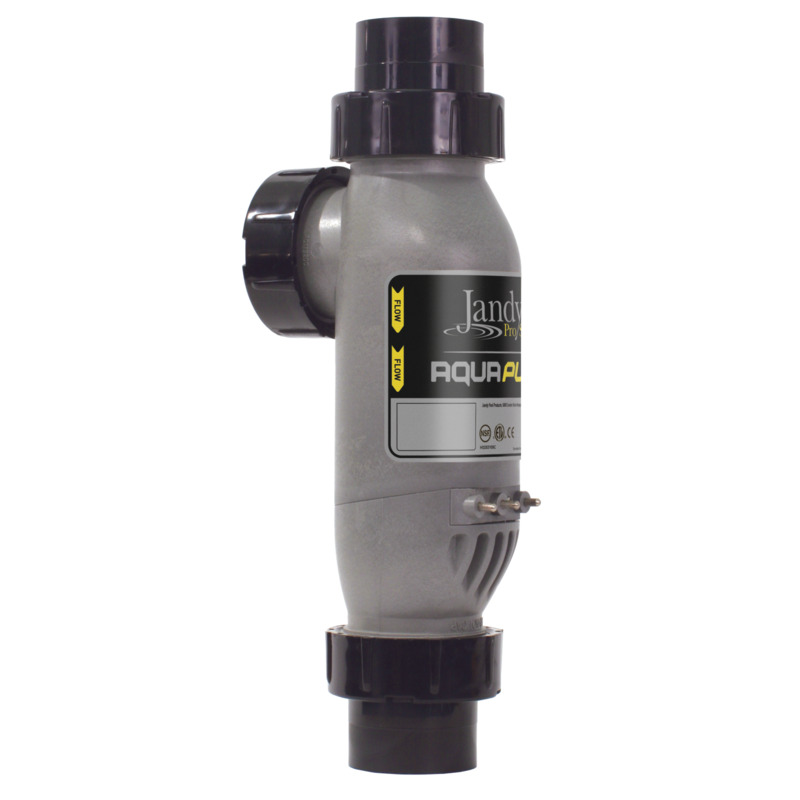 The Jandy AquaPure® salt-water chlorine purifying systems use salt water to deliver high-performance water purification with uncompromised performance, reliability and hydraulic efficiency. Rely on its sturdy design and simple features to create your saltwater oasis. *Pool sizes are generalizations and may vary with environmental conditions. Pools with greater exposure to sunlight may require greater chlorine production capacity. “Cell On” indicator does not come on. 1. Adjust CHLORINE PRODUCTION to desired percentage. 2. Remove obstruction and/or clean cell. See Section 6.3 of the owner's manual Electrolytic Cell Cleaning. 3. Plug in flow/temp/salinity sensor. See Section 2, Figures 2a, 2b, and 2c of the owner's manual. 4. Add salt as described in Section 4.7 of the owner's manual. 1. Decrease the chlorine production rate adjustment button (arrow button A). See Section 5 of the owner's manual, Operating Instructions. If chlorine output at the lowest setting consistently provides for excessive chlorine levels, decrease daily pump operation time as much as necessary. If chlorine output at lowest setting is still excessive then the salt water chlorinator system is oversized for the pool. 1. Manually shock the pool following the directions in Section 5.4.1 of the owner's manual, Shocking. Cloudy Water, Slimy Walls of Pool. 1. Brush down the affected walls and follow the directions in Section 5.4.1 of the owner's manual, Shocking. 1. Balance the water to recommended levels in Section 4.5 of the owner's manual. 1. Add stabilizer to maintain 50 - 75 PPM per pool professional’s recommendations. 2.Increase the system operating time per day. See Section 5, Operating Instructions section of the owner's manual. 3. Increase chlorine production by pressing the Chlorine Production Rate Adjustment button (arrow button B). See Section 5, Operating Instructions of the owner's manual. 4. Increase chlorine production by pressing the Chlorine Production Rate Adjustment button (arrow button B). See Section 5, Operating Instructions of the owner's manual. 5. Set “Boost” mode and allow to run for 24 hours. Recheck. If still too low, Super Chlorinate with outside source. (Take pool water sample to Pool Professional). See Section 5, Operating Instructions of the owner's manual. 6. Test salinity by pressing the Test Salinity button. See Section 4, Table 2 of the owner's manual. 7. Super Chlorinate Pool. See Section 5.4 of the owner's manual, Startup. 8. Remove cell for inspection. Clean if necessary. See Section 6 of the owner's manual, User Maintenance Instructions. 9. Contact a pool professional. No display on LCD (Screen is blank). 1. Check power. Turn on pump. This could be a defective automatic timer or pump switch or loose connection at the automatic timer or pump switch. 2. Check that ribbon cable is fully inserted into connector. 3. Check that unit is correctly wired for 240 VAC and connected to 240 VAC. 4. Check connector at white plug to insure proper connection. If burnt connector contact authorized service representative. “No Flow” indicator stays on continuously. 1. Check for correct operation of the pump. Ensure there is no loss of pump prime or clogged strainer baskets. 2. Check and correct all valve alignments. 3. Follow filter cleaning procedures. 4. Remove cell for inspection. Follow cleaning procedures. See Section 6.3 of the owner's manual, Electrolytic Cell Cleaning. 5. Ensure that the flow/temp/salinity sensor is installed according to Section 3, Figure 11 of the owner's manual. If not, contact a pool professional. 6. Plug flow/temp/salinity sensor into connector on power center printed circuit board. Turn power to unit off and back on (Cycle Power). See wiring diagram in Figures 2a, 2b, and 2c of the owner's manual. See also, Section 6.4, Flow/Temp/Salinity Sensor Cleaning, Step 4 of the owner's manual. 7. Remove and clean flow/temp/salinity sensor and reinstall. See Sections 6.4 of the owner's manual. 8. Contact a pool professional. 1. Backwash or partially drain pool and dilute with fresh water until salinity returns to 3.0 gpl to 3.5 gpl. 1. Add salt to pool, 3.0 gpl to 3.5 gpl. See Section 4.7 of the owner's manual. 3. Remove and clean flow/temp/salinity sensor contacts. Check flow/temp/salinity sensor cable for damage. See Section 6.4 of the owner's manual. Verify salinity with Myron “L” meter calibrated for NaCl, titration test units, or other salt meters. Please be aware that salt test strips have a large variance in readings (400 - 800 ppm). Scale formation on pool equipment. NOTE: To clean the deposit (scale) on the electrolytic cell plates, see Section 6.3 of the owner's manual. 1. 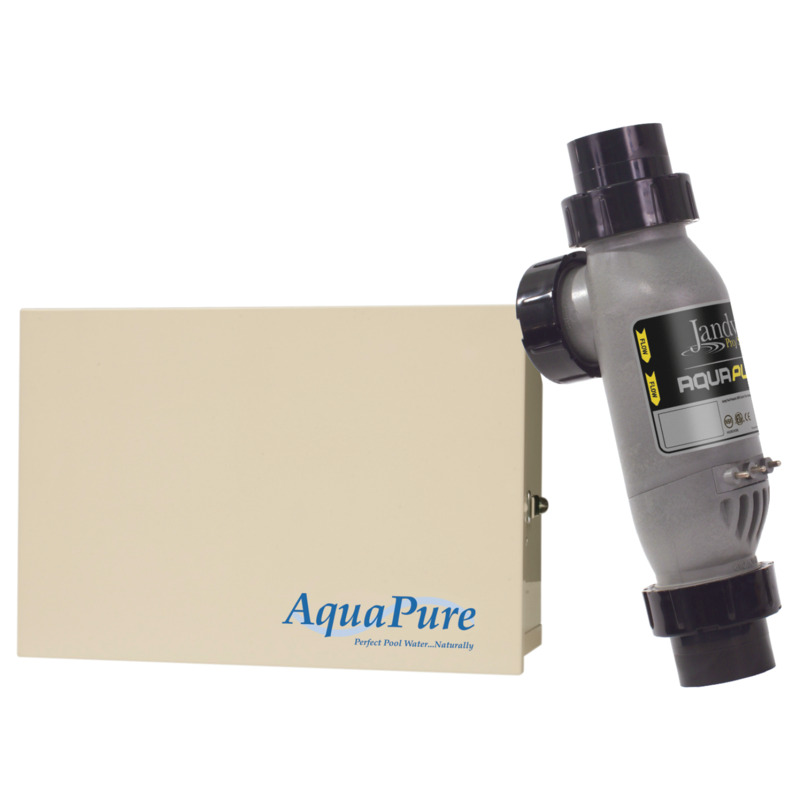 Adjust total alkalinity to 80-120ppm. Then adjust pH to within the range 7.4-7.6. See Section 4.5 of the owner's manual. 2. Dilute pool with fresh water. Consult your pool professional regarding use of a sequestering agent. 1. Test salinity. Add salt as described in Section 4.7 of the owner's manual. 2. Refer to Maintenance Procedure for acid wash cleaning. See Section 6.3, Step 2 of the owner's manual. 3. Check connection. Check for dirt or corrosion around DC cord contacts at cell. Check Cell studs for same. 4. Plug flow/temp/salinity sensor into connector on power center printed circuit board. (Cycle Power). 5. Winterize your pool. See Section 6.5 of the owner's manual, Winterizing. 6. Contact a pool professional.